In the wild, canines and felines eat muscle meat, organ meat and the vegetable matter from the gut of their prey animal. Complete Mix mimics the gut content and when mixed with meat, makes a truly balanced natural diet which they have evolved on over millions of years. 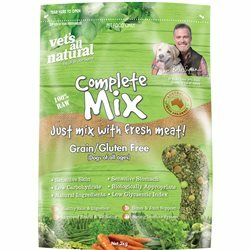 Complete Mix Grain/Gluten Free is an everyday diet mix to add to fresh meat for adult dogs and puppies. Dr Bruce has formulated this variety for those wanting to feed their dog a Grain/Gluten Free alternative as an everyday diet and is ideal for dogs with a gluten and/or grain intolerance. 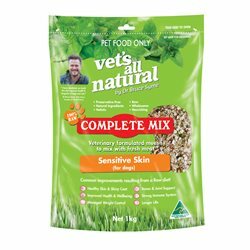 Dogs that have had ongoing sensitive skin and/or sensitive stomach issues should also consider this variety. The balanced ingredient and low carbohydrates help to correct underlying intestinal and digestion problems therefore supporting irritable bowls and sensitive stomachs. If you are feeding a Grain Free dry food, we’d encourage you to add at least some balanced fresh meat with Complete Mix Grain Free and watch your dog enjoy the succulent meat they naturally crave.